Drs. Louis and Dominic Vitangeli are strong proponents of the Invisalign® system for Englewood, OH patients. Invisalign invisible braces offer Dayton area patients custom clear trays that perfectly fit teeth and gradually bring them into ideal alignment for straight teeth. If you are a teenager or an adult with crowded, rotated or misaligned teeth, Dayton’s Invisalign invisible braces are the best option for straight teeth. Advanced Comfort — no harsh brackets or wires to irritate your cheeks and gums. Rapid Alignment — complete the process much faster than with traditional orthodontics. 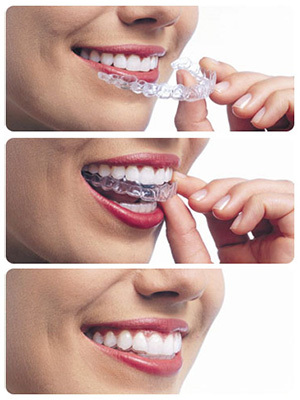 Transparent Tools — Perfect smile with confidence–no one will see your braces! Improved Convenience — Easily pop your aligner out to eat, drink, brush and floss. Invisalign invisible braces significantly reduces the occurrence and level of discomfort involved in the realignment for straight teeth process. In fact, patients who previously wore traditional braces report that Invisalign invisible braces provide much greater comfort. Our Englewood Invisalign invisible braces providers will tell you the first step toward straight teeth is a records appointment. We conduct a series of digital photos, digital panoramic X-rays and specialized Invisalign invisible braces scans of your upper and lower arches. At the same time, we’ll sit down with you and discuss how you want to improve your smile. From the information we gather, we send specifications to the Dayton Invisalign invisible braces lab. Based on the specs we send, Invisalign will return a virtual email of how your smile with straight teeth will appear after the treatment. We work backward from there, making any final changes to our measurements to ensure just the right results. At that point, we provide a series of clear aligners that will change every two weeks, along with a custom retainer to be worn for a specified amount of time after the treatment. Have your teeth shifted since you wore braces? Invisalign is the ideal, discreet Dayton dental solution for you and your teenage children who want straight teeth in Englewood, OH and straight teeth in Dayton. We encourage you to visit our dental office today to learn more.